Over the past seven years, two LPs and countless tours, JD McPherson has gained a reputation for updating the American rockabilly sound. With his fat, fuzzed-out riffs (usually played on a custom TK Smith guitar or other funky bodied, automobile inspired axe) and accompaniments from upright bassist Jimmy Sutton, keyboardist Ray Jacildo, drummer Jason Smay and a touring brass section, McPherson’s last two records sounded old-school barn dance updated for modern ears, transmitted through earbuds instead of among hay bales. Yet, on his third album Undivided Heart & Soul, McPherson takes a slightly different approach, leaning harder on the first syllable of rockabilly. New beginnings and friendships also likely contributed to the sonic streamlining. Undivided Heart & Soul is his first New West Records and the list of collaborators is both long and impressive. During the writing process, McPherson worked with Queen of the Stone Age’s Josh Homme and Dean Fertita to transition from writing more fictional narratives to personal experiences for the first time. And during the recording process, other notable guests included Butch Walker on the mid-tempo “Crying’s Just a Thing that You Do” and even sharing lyric-writing credits with his wife Mandy on the escapist closer “Let’s Get Out of Here While We’re Young.” Plus, Lucius’ Jess Wolfe and Holly Laessig contributed vocal harmonies and drummer Dan Molad co-produced the entire record. History still carries the most weight on the 11-track LP. McPherson and his family moved from their home state of Oklahoma to East Nashville in between 2015’s Let The Good Times Roll and the new record, and he and the band recorded in Nashville’s historic RCA Studio B, whose walls could tell stories of legends like Dolly Parton and Elvis. And the retro-sounding tracks, most of which feature prominent walking bass lines courtesy of silver fox Sutton, are among the album’s highlights. Single “Lucky Penny” (that doesn’t hide its Dan Auerbach influence), jittery “Bloodhound Rock” and “Under the Spell of the City Lights” (featuring another notable co-writer, Aaron Lee Tasjan) all harken back to those retro rocking songs in both McPherson’s own catalogue and that of American music as a whole. 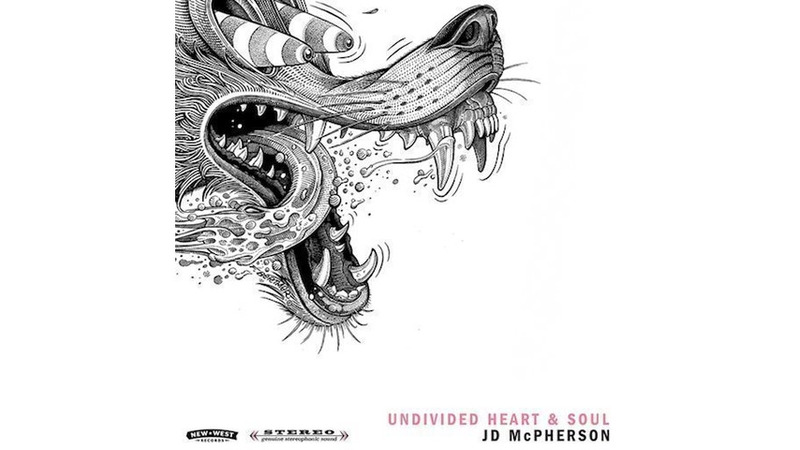 So while Undivided Heart & Soul explores both the past and the future of roots music, McPherson shines brightest when he blends both influences to stay rooted in the present. Click here to check out JD McPherson’s 2016 Daytrotter session.